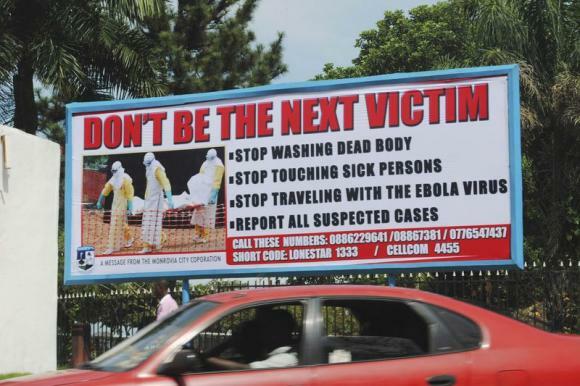 (Photo: REUTERS / James Giahyue)A car drives past a public health advertisement against the Ebola virus in Monrovia October 8, 2014. The Ebola outbreak in Liberia continued to deteriorate, with a recorded death toll of 2,210 so far and 200 suspected or probable new cases in Monrovia in each of the past three weeks, and the reappearance of Ebola in Grand Cape Mount District for the first time in three weeks, the World Health Organization said. United Nations leaders and the World Council of Churches have agreed that the international community and faith leaders need to cooperate more on working to fight the scourge of the lethal Ebola virus. They met at an event titled "Ebola 60 days follow-up" at the Ecumenical Centre in Geneva on 28 November 28. It was a follow-up to a September 29 meeting hosted by the WCC in Geneva. In a Skype call to the November consultation Dr. David Nabarro, the UN Secretary General's Special Envoy on Ebola, said, "The faith groups are absolutely key to the Ebola response because they have access to the communities." The meeting aimed at drawing on the expertise, experience and wisdom of key staff from the WCC, the United Nations, World Health Organization (WHO), UNICEF, UNAIDS, ILO, IOM, the ACT Alliance, the Lutheran World Federation, Caritas Internationalis, faith communions, German Institute for Medical Mission (DIFAEM), Bread for the World, and other crucial stakeholders, to dialogue and strategize on current responses to Ebola. The Ebola virus "strikes straight into the heart" of what it is to be human, the Archbishop of Canterbury, Justin Welby, said in a video recorded for the WCC meeting. He stressed the "absolutely crucial" contribution of churches and other faith communities in responding to the crisis. The Anglican leader spoke of the "deep sorrow" he encountered on a visit to West Africa in October, where he met with the Chief of Staff of the UN Mission for Ebola Emergency Response (UNMEER) in Accra, Ghana. "You're infected by the people you love most, and grieve for most – they are most dangerous to you when they've died," noted the archbishop. The WCC meeting assembled representatives of Christian health, development and aid organizations and UN agencies to learn from each other and seek ways of collaboration to escalate their efforts. WCC general secretary Rev. Olav Fykse Tveit, said, "This is both a medical crisis and a community crisis. Member churches of the WCC as a community are assisting families." Children are particularly vulnerable and many of them find themselves without parents due to the disease. He said church-based institutions can be extremely effective in Ebola affected countries and that supporting them is "extremely important." Tveit cited the words of the WHO associate general secretary Dr. Keiji Fukuda, in a meeting on 2 October, who said that the UN can send in the army to deal with the logistics involved in preventing the spread of Ebola and provide the necessary treatment facilities. But that is as far as they can go. The WCC and the faith community have to leave the "last mile" to the community. Dr. Sue Parry from the WCC's health and healing programme said there has been development of a strategy on how the church community can combat Ebola globally and there been many consultations with the WHO and other key actors. She cited a meeting from November 24 to 26 in Nairobi on the Ebola response that drew church leaders, church health worker, interfaith groups and the UN to help map out future responses. (Photo: Ecumenical News / Peter Kenny)Rev. Andre Karamaga speaking before church leaders and church health workers on Ebola. Parry noted that the WCC represents more than church leadership and a worldwide Christian body. "It also has this extensive network of health service delivery. They are contributing to a substantial proportion of national health care across Africa. Often they are the only points of health care in the more rural and remote areas of the various countries in which they are found." She said, "We are not only looking at Ebola as an emergency response." 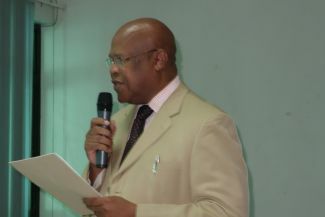 Parry said the communities that the disease has impacted in Liberia, Guinea and Sierra Leone have been devastated and the social fabric is being destroyed. "Where it is happening are countries that have just come through civil conflict." The Rev. Andre Karamaga, All Africa Conference of Churches general secretary, said at the Nairobi meeting, "Churches were taken by surprise by the crisis." He observed, "When people are afraid of a sick person that is a terrible situation." Karamaga said, "We need to give a person a dignified burial. When practices are broken it is a challenge." He was referring to customs having religious significance such as washing bodies before burial that have led to Ebola deaths and have had to be abandoned.